Dr. Keith M. Bradshaw serves as Associate Dean of the College of Performing and Visual Arts and Professor of Music at Southern Utah University. He teaches courses in music theory, aural skills, analysis, composition, and orchestration. He received his Ph.D. in composition from the University of Minnesota, and his M.M. and B.M. from Brigham Young University. Prior to coming to SUU, he founded the music program at Southern Virginia University, and served as chair of the division of arts. Compositionally his music is contemporary but accessible, and has been performed nationally and internationally. He has received numerous commissions and awards for his compositions, including a fellowship from the McKnight Foundation, two commissions from the Barlow Endowment, and winning the national "Welcome Christmas" Christmas carol contest from the American Composers Forum. 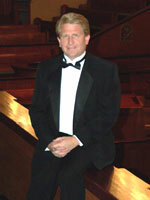 He is currently composer-in-residence with the Orchestra of Southern Utah. In addition to composition, Dr. Bradshaw is the founding director of the Red Rock Singers, a mixed choir of 40 voices in Cedar City, Utah, and has conducted various college and community choirs.